The U.S. Department of Homeland Security has urged Windows users to uninstall Apple's QuickTime player immediately due to hacking dangers. Apple has recently announced that it will no longer provide updates for its QuickTime media player software on Windows, so it is urgent to uninstall QuickTime for Windows 10/8/7 for the security of your PC. You will need the best free QuickTime alternative for your Windows 10, Windows 7 to manage and play video music files in MP4, MKV, AVI, MP3, AAC, etc. after you have successfully uninstalled QuickTime for Windows and removed QuickTime 7 web plug-ins completely. QuickTime for Windows was initially bundled with iTunes and it is a necessary application for some third-party software tools on Windows, some of which rely heavily on QuickTime player to play audio and video on Windows 7 and Windows 10. 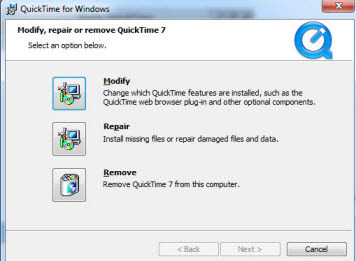 Why You Must Uninstall QuickTime for Windows? Despite that QuickTime has problem of playing WMV, MKV, etc., according to TrendMicro, there are two vulnerabilities found in QuickTime for Windows that left this software insecure and it had been reported to Apple, but Apple has no intension of fixing either of these problems of QuickTime for Windows. Those two critical problems allow criminals to hack into computers with QuickTime for Windows installed if the devices' users either run malware or visit a malicious webpage. And without security patches being issued by Apple, QuickTime for Windows poses a very serious threat to those who running it. This security firm added "The only way to protect your Windows systems from potential attacks against these or other vulnerabilities in Apple QuickTime now is to uninstall QuickTime for Windows." How to Uninstall QuickTime for Windows 10/8/7? Step 1: Click the Start icon . Step 2: Click on the Control Panel from there. Step 3: Go to Programs and then click Programs and Features to find QuickTime for Windows Program. Step 4: Select QuickTime for Windows and then click uninstall. Step 5: From there, select to remove QuickTime 7 from Windows. When you managed to uninstall QuickTime for Windows 10/8/7, you are welcomed to download and install the best QuickTime for Windows alternative – 5KPlayer on this page for free! 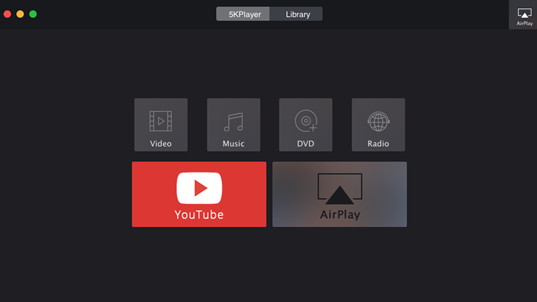 5KPlayer – best free QuickTime for Windows alternative is one of the best media players for Windows 10 which is a light weighted standalone media player software that works perfectly on Windows 10/8/7/Vista. This free QuickTime for Windows alternative makes video music playback much easier and sufficient. It supports 450+ video codec including MKV, MP4, H.265/HEVC, H.264, Xvid, etc. and 180+ audio codec such as MP3, AAC, WMA, MOA, FLAC and more. Besides, when you are playing videos with 5KPlayer, you are free to add subtitles, rotate videos, and desktop sharing with it. It even fixes QuickTime for Windows not playing MP4 problem. Simply download this free QuickTime alternative to create and manage your personalized media library now and then you will know, how wise you are to uninstall QuickTime for Windows 10/8/7 and replace it with 5KPlayer! Step 1: Free download the best QuickTime for Windows alternative on your PC (Windows 10/Windows 8/Windows 7). Install and open it. Click "5KPlayer" on the top. Step 2: Among the listed icons, choose the first one – "Video" and then open your local computer and add the source video file from your computer. 5KPlayer accepts any video formats, resolution and definition (720p, 1080p, 4K, 8K, and up). Then this QuickTime for Windows alternative just plays the video directly. Other than playing multimedia files, this superb QuickTime for Windows alternative also downloads videos and music from 300+ online video sites such as the top trending Disney movies Zooopia, The Jungle Book, etc. Plus, it supports to stream videos in MP4, MOV, M4V from Windows to Apple TV, Mac, or another Windows set.